This broken levee is on the Missouri River west of Hamburg, Iowa, shown from an airplane view. The white smoke in the background is from a coal plant in Nebraska operated by the Omaha Public Power Administration. The 11 levees that failed last week during catastrophic flooding along the Missouri River were maintained by local associations or private owners, with just one inspected by the Army Corps of Engineers this year, KCUR and APM Reports has found. As losses mount in Nebraska, Kansas, Iowa and Missouri, the flooding has refocused criticism on the Corps’ long-term management of the river. The Corps provides oversight for smaller levees, called "non-federal," run mostly by agricultural and other landowner groups. Seven of the 11 levees were found to be “minimally acceptable” in the early 2010s and there are no records showing inspections for three others, according to an analysis of information from the National Levee Database, which is operated by the Corps and the Federal Emergency Management Agency. The first levee breaches, which flooded the corner where Missouri, Iowa, Nebraska and Kansas meet, were on March 15. 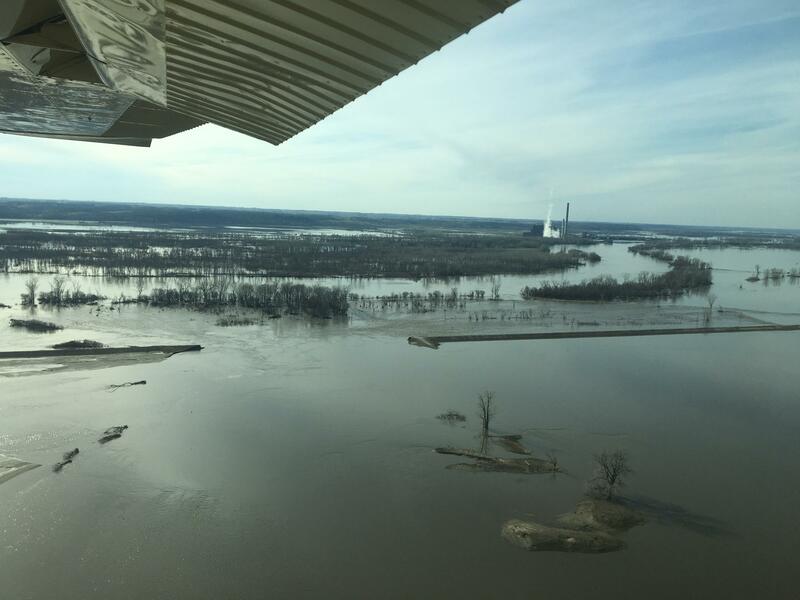 The muddy Missouri River now covers the entire area, forcing towns to evacuate, closing Interstate 29 from Nebraska nearly to St. Joseph, Missouri, and shutting down spring planting for the area's farmers. "I've never seen anything like it in my lifetime," said Richard Oswald, a farmer whose home where he was born in 1938 near Langdon, Missouri, is now under water. Seen from above, church spires peak out from the water where small towns used to be. Center-pivot irrgiation systems, once towering 14 feet over farmland, look like still snakes in the water. Steel grain bins, full from last year's record harvest, slump over, yellow corn spilling into the water. The Corps does two types of inspections on federal and non-federal levees, according to its website. Routine inspections are “typically conducted each year” on levees under its safety program, the site says. Periodic inspections are done every five years, led by a professional engineer. There are three inspection ratings, the site says: acceptable, minimally acceptable and unacceptable. The seven Corps' inspections of last week's breached or overtopped levees date back to 2010 and 2012, according to the National Levee Database. Two of the levees don’t fall under the Corps’ authority during disaster responses. Much of the decision-making for the smaller levees is left up to the district directors. But Bob Criss, an emeritus professor of hydrogeology at Washington University in St. Louis, blames the Corps for the flooding. The agency has reshaped a historically shallow, multi-channel, wide river into a slim channel that runs too high and floods too easily, “like a piece of spaghetti on a plate,” he said. The Corps of Engineers didn’t respond to requests for comment. Tom Waters, chair of the Missouri Levee and Drainage District Association, does not not believe the Corps was lax on inspections, noting that districts do their own inspections. He pointed instead to the "bomb cyclone" that hit the central U.S. mid-month. The system of district associations are organized much like a school district, Waters said, so people living in the district are taxed to pay for the building and upkeep on the levees. Among the levees that failed last week was one built by the federal government — in 1953 in Doniphan County, Kansas. The others were built by the local districts or private landowners, he said. If anything is to blame, Waters said, it’s the failure to improve the U.S. flood control infrastructure. When the levees fail, districts are required to repair to the pre-flood condition, some of which date back to the 1950s, he said. “At the same time, we’re seeing higher river levels and more water coming faster, so higher volume and higher velocity in the river system, and we haven’t done anything with the flood control infrastructure to compensate for that,” Waters said. Criss, the professor at Washington University, said the flooding is a man-made problem and any suggestion that it’s due to climate change is wrong. While Criss believes that global warming may be part of the problem, the flooding was brought on by a river sculpted by the Corps, combined with the levee breaks, which create high velocity waters, he said. Natural flooding is gentle, about a foot a day, he said, not torrents of water ripping up everything in sight. Among those criticizing the Corps for mismanaging the flooding systems is Missouri Gov. Mike Parson. In declaring a state of emergency Thursday, Parson said he’s concerned and wants to “have a good conversation” about the agency’s role. “I think there’s a long history with the state not really being happy with the Corps of Engineers, how they conduct this thing, how they’re doing these levees, and how they’re actually using the waterways in our state,” Parson said. A 2018 decision by a federal judge, in a case that began in Kansas City and ended up in Washington, D.C., found that the changes the Corps made in 2004 increased the likelihood of flooding and landowners should get $300 million for the “taking” of their land by flood. The suit was brought by 372 landowners in six states and was led by Dan Boulware, a St. Joseph, Missouri, attorney. The area currently flooded is ground zero, Boulware said, because it’s the site of the worst flooding, in 2007, 2008, 2010, 2011, and 2019. The court found that the Corps had changed its priority from protecting landowners against flooding and instead decided to construct more habitat for fish and wildlife. Boulware and Waters said the next step to help protect landowners along the river will take an act of Congress, who must take a fresh look at the Corps’ priorities. “I feel Congress has a lot of the blame to shoulder,” Waters said. Missouri and Kansas haven't yet added up losses. In Nebraska, the storm caused $1.3 billion in damages, and in Iowa, $1.6 billion. Oswald, the Missouri farmer, said he doesn't expect that he'll be able to plant crops this year and he lost 20,000 bushels of corn stored from last year's harvest. He thought he lost his home during the 2011 flood, but he went back four months later after the waters receded. In 2011, Oswald said, they had enough warning to prepare to evacuate, but this time he just had a few days warning. "That's the only home I've ever known," Oswald said. "It's very hard to realize I, nor anyone, will ever live there again." Here are the levees that were breached or overtopped as of March 22, according to the U.S. Army Corps of Engineers. This information was compiled from reports in the National Levee Database, which is maintained by the Corps and FEMA. Union Township: Two segments of this levee near Big Lake in Holt County, Missouri, were among the first to break down, on March 15. The area's mostly farmland, but has a daytime population of 153. It was locally constructed and maintained by the Union Township Levee District (Union Township segment) and Holt County Levee District No. 10 (Holt County No. 10 segment). Although the levee database said that the “likelihood of a flood overtopping this levee in the next year has been estimated at 20 percent, or one chance in five,” a flood was inevitable. Holt 10: This levee in Holt County, Missouri, was breached on March 15. The two sections of roughly nine miles found in this levee district had very little information and no inspections on record. It’s maintained by Holt County Levee District No. 10. Holt 15: This levee that doesn’t fall under the federal law that allows the U.S. Corps of Engineers to use disaster response authority. It was breached on March 16. Corning: This levee doesn’t fall under the federal law that allows the U.S. Army Corps of Engineers to use disaster response authority. It was breached on March 16. Holt 9: This levee system, which was breached on March 17, is 13.5 miles long and snakes through Holt County, Missouri, farmland. It’s operated and maintained by the Holt County Levee District. Although this levee was breached during the record flooding of 1993, the last assessment, in 2016, found that the likelihood of a breach was estimated at 2 percent, or one chance in 50. “The risk assessment identified some concerns with pipe inspections, sod cover, seepage, emergency preparedness, and the likelihood of the levee to breach when overtopped,” the report said. Canon: This levee near Forest City in Holt County, Missouri, was breached on March 20. Built In 1950 and nearly two miles long, there is no record of an inspection or risk screening. It’s operated by the Canon Drainage District of Holt County. Grape Bollin Schwartz: This 4.7-mile levee of farmland in Atchison and Leavenworth counties in Kansas was breached on March 20. There is no record of an inspection and it’s operated by the Grape-Bollin-Schwartz Levee Association. Bean Lake: This levee system, which runs seven miles in Platte County, Missouri, was breached on March 20, as well as during the flood of 1993. It’s operated by two agencies, the Platte City Drainage District (Platte County Section 2 segment) and the Bean Lake Levee Association (Bean Lake segment). It was inspected in June 2012. “The risk assessment identified some performance concerns with seepage, sod cover, and emergency preparedness planning,” the report said. Rushville Sugar Lake: This is a 10.2-mile levee running across Buchanan and Platte counties in Missouri and operated by the Rushville Sugar Lake Levee District. It was last inspected in June 2012. “The risk assessment identified some concerns with slope stability, seepage, pipe inspections, and emergency preparedness,” the report said. MRLS 500R: Doniphan County, Kansas, breached March 21. Henry Pohl: The only levee inspected this year, on Jan. 28, it runs nearly four miles in Atchison County, Kansas. It’s maintained by the Atchison County, Kansas, Conservation District. The risk assessment said that the “likelihood of a flood overtopping this levee in the next year has been estimated at 5 percent,” or a one-in-20 chance. “The risk assessment identified some concerns with pipe inspections, emergency preparedness, pressurized pipes running over the levee, and seepage,” the report said. APM Reports Angela Caputo contributed to this report. Peggy Lowe is an investigative reporter based at KCUR, which is part of an investigative reporting collaboration with APM Reports. She’s on Twitter @peggylowe.